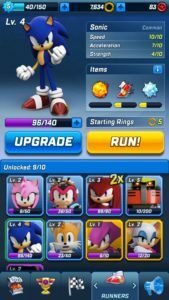 Does the latest Sonic mobile game offer a fresh take on the tired endless runner formula? Out of the blue, SEGA dropped a new game out in the Philippines called Sonic Forces: Speed Battle. Named after Sonic Forces, which isn’t coming out until November, the game is developed by Hardlight Studio. The name should sound familiar because they are the same studio that created such games like Sonic Jump, Sonic Dash and Sonic Dash 2: Sonic Boom. T he game isn’t available in the United States just yet, but due to some drastic measures, we were able to get our hands on the game and give you a preview of what’s in store. First off, the game is only on the Philippines App Store, so automatically, you need an Apple device to download the game. No word has been said about an Android release. You proceed to download it like any other iOS game and they put you right in to the game. Like Sonic Dash and Sonic Dash 2, you control Sonic by swiping up, down, left and right to avoid obstacles, jump and slide under objects. However, Speed Battle takes some interesting departures from the previously mentioned games, so if you weren’t a fan of them, be sure to read on to see if this entry might interest you. Speed Battle’s biggest change is it’s not an endless runner. Instead, you are put in a race against your standard fare of Sonic characters, racing throughout a variety of levels from Sonic Forces, where you try to reach the goal to earn points and rank up the leaderboards. The level design is fairly straightforward with different paths that you can take to reach the goal. Rings, as always, play an important factor in the game. The amount of rings you collect can change your speed during the game, while losing rings causes your character to decrease in speed. Another notable addition is the option to race against other people in online matches. It’s a nice touch since racing against the AI can only give you so much of a challenge. You’ll also want to ensure you’re connected to WiFi, lest you desire to eat up all the available data in your data plan. Beginning the game, the first character everyone starts off with is Sonic. To unlock the rest of the cast of characters, you must finish a level in first place, where you’ll be rewarded with a chest. Now, just because a chest contains a character, it doesn’t necessarily mean you get the character right away. You see, all characters start off at Level 0, and you must level them up to a Level 1 before they become unlocked. It’s a weird gimmick, but unlocking the characters goes by super fast. Each character has a set of special abilities for each of the following slots: projectile, a speed boost, a barrier and a shield. Each ability has a unique look that fits with your chosen character, but they’re all essentially the same item, just with a different skin. One exception, however, is with Knuckles, Vector, and Omega as their speed boost is replaced with invincibility. You can also use rings you collect with the chests to upgrade the abilities anytime you level up any character. It can range from how long a certain ability will last, to how many rings you start off with. Other than that, the characters are pretty much made to match up with each other. Aside from the core game, there are leaderboards you can check in between races to see where you rank against your friends and worldwide competition. The leaderboards also determine which levels you are allowed to play. A rookie starts off at either Temple Gate or Sunset Bridge. After ranking 100 points, you’ll unlock Tier 2 and have Pyramid Valley and so on. After a certain amount of time goes by, you’ll be able to open a free chest. You have the option of watching ads to speed this process up, like in previous games. And, of course, you’ll collect Red Star Rings that are used as currency to purchase additional items. Overall, I’m having a lot of fun playing Sonic Forces: Speed Battle. Trying to rise up the leaderboards to open new levels feels very achieving. 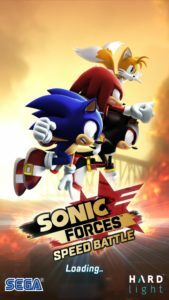 I can understand why SEGA and Hardlight would put time to make this game to promote Sonic Forces as the upcoming Sonic game is all on SEGA’s mind right now. The game does have some frame-rate issues, but I’m sure Hardlight will fix it up in time for an official release. Hopefully, everyone can get a chance to play Sonic Forces: Speed Battle in the near future. But for now, I’ll be playing some more Sonic Forces: Speed Battle, because this is the closest I’m going to get to play anything Sonic Forces related until the official release.